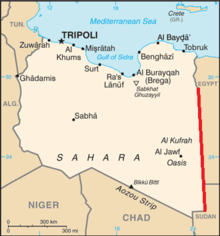 The Frontier Wire was a 271 km (168 mi) obstacle in Italian Libya, along the length of the border of British-held Egypt, running from El Ramleh, in the Gulf of Sollum (between Bardia and Sollum) south to Jaghbub parallel to the 25th meridian east, the Libya–Egypt and Libya–Sudan borders. The frontier wire and line of covering forts, were built by the Italians during the Second Italo-Senussi War (1923–1931), as a defensive system to contain the Senussi population, who crossed from Egypt during their resistance against the Italian colonisers. From the Italian declaration of war on 10 June 1940 to late 1942, it was the scene of military engagements between Italian, British and German forces as the fighting ebbed and flowed across the frontier. In 1922, Benito Mussolini continued the Riconquista of Libya, in the Second Italo-Sanussi War (1921–1931). The frontier wire was built by the Italian army, under the command of General Rodolfo Graziani, in the early 1930s, as a means to repress Senussi resistance against the Italian colonisation, by hindering the movement of Senussi fighters and materials from Egypt. The wire comprised four lines of 1.7 m (5.6 ft) high stakes in concrete bases, laced with barbed wire 320 km (200 mi) long, just inside the border from El Ramleh on the Gulf of Sollum, past Fort Capuzzo to Sidi Omar, then south, slightly to the west of the 25th meridian east, the border with Egypt and Sudan. Three large forts at Amseat (Fort Capuzzo), Scegga (Fort Maddalena) and Giarabub and six smaller ones at El Ramleh on the Gulf of Sollum, Sidi Omar, Sceferzen, Vescechet, Garn ul Grein, and El Aamara were built along the wire. [lower-alpha 1] The wire was patrolled using aircraft and armoured cars from the forts, by the Italian army and border guards, who attacked anyone seen in the frontier zone. British patrols closed up to the frontier wire on 11 June 1940 and began to dominate the area, harass the garrisons of the frontier forts and set ambushes along the Via Litoranea Libica (renamed Via Balbia later in 1940) and inland tracks. Some Italian troops were unaware that war had been declared and seventy were captured during the day, on the track to Sidi Omar. British patrols ranged north to the Via Litoranea Libica, on the coast between Bardia and Tobruk, west to Bir el Gubi and south to Giarabub. Italian reinforcements then arrived at the frontier, began to reconnoitre, improved the frontier defences and recaptured Fort Capuzzo. On 13 August, the British raids were stopped to conserve the serviceability of vehicles and the Support Group of the 7th Armoured Division took over, to observe the wire for 97 kilometres (60 mi) from Sollum south to Fort Maddalena and be ready to fight delaying actions against an Italian advance. Fort Capuzzo (Redondo Capuzzo) was one of the forts built near the border with Egypt and the frontier wire, part of a system of frontier control built in the early 1930s. The Via Litoranea Libica ran south from Bardia to Fort Capuzzo, 13 kilometres (8 mi) west of the port of Sollum in Egypt, then east across the frontier, down the escarpment to the coast. The fort was built with four crenellated stone walls around a yard, with living quarters on the edges. A track ran south from the fort, just west of the frontier wire and the border, to Sidi Omar, Fort Maddalena and Giarabub. On 14 June, after the Italian declaration of war on Britain four days earlier, the 7th Hussars and elements of the 1st Royal Tank Regiment, Gladiators of 33 Squadron Royal Air Force (RAF) and Blenheims of 211 Squadron captured Fort Capuzzo, as the 11th Hussars took Fort Maddalena about 60 miles (97 km) further south. The fort was not occupied long, for lack of troops and equipment but demolition parties visited each night to destroy Italian ammunition and vehicles. The Italians reoccupied Fort Capuzzo and held it with part of the 2nd Blackshirt Division (28 October) (Luogotenente Generale Francesco Argentino). On 29 June, the Maletti Group repulsed British tanks with its artillery and then defeated a night attack. During the frontier skirmishes from 11 June – 9 September, the British claimed to have inflicted 3,500 casualties for a loss of 150 men. On 16 December, during Operation Compass (9 December 1940 – 9 February 1941), the 4th Armoured Brigade of the Western Desert Force captured Sidi Omar and the Italians withdrew from Sollum, Fort Capuzzo and the other frontier forts. Number 9 Field Supply Depot was established at the fort for the 7th Armoured Division. The fortified camp at Sidi Omar was ringed with barbed wire, trenches and minefields. 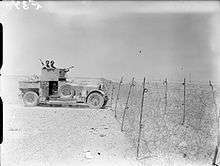 On 11 June 1940, the 11th Hussars in Rolls-Royce and Morris CS9 armoured cars closed up to the frontier wire, crossed during the night and exchanged fire with the garrison at Sidi Omar. Sidi Omar was captured on 16 December, during Operation Compass by the 7th Hussars, 2nd Royal Tank Regiment (2nd RTR) and the 4th Royal Horse Artillery (4th RHA). After a bombardment, the British tanks charged the fort, one broke through the wall and after another tank drove through the hole, the garrison began to surrender. The Italians had concentrated their firepower on the east wall facing Egypt and had been surprised by an attack from the west. The fall of the fort left the way clear for the British to send reinforcements and supplies to the forces further north on the coast, free from the possibility of attack from the inland flank. 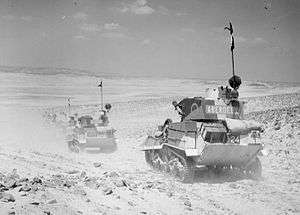 Two 11th Hussar armoured cars attacked the Italian column at Nezuet Ghirba, about 18 miles (29 km) west of Sidi Omar, on a plain devoid of cover, along the route of the smaller Italian column. D’Avanzo, formed a defensive square, with the four guns at the corners, the infantry along the sides and the twelve L3 light tanks patrolling outside. The British reinforced the 11th Hussars with the 7th Hussars armoured cars and a mixed force of light tanks, a cruiser squadron of Cruiser Mk I (A9) tanks and an artillery battery. The Italian tanks charged forward ahead of the artillery and infantry and were knocked out. The British then circled the Italian square, firing at the lorries and infantry and after the second circuit, the Italian artillery opened fire. The Italian gunners had only high explosive ammunition and the British concentrated on the guns at each corner. Lacking cover the Italian gunners were soon shot down and then the infantry broke. The British destroyed 12 light tanks, the four guns and killed or captured 100 of the 400 Italian infantry. A Squadron of the 11th Hussars made three gaps in the wire on the night of 11 June, cut telephone poles on the Italian side and skirmished around the fort. On 13 June, an armoured car troop attacked the fort and was repulsed by the garrison, then attacked by aircraft as they retreated. The 11th Hussars reconnoitred again on 14 June, with part of the 4th Armoured Brigade ready to attack but the garrison surrendered, the British taking 18 prisoners and destroying equipment, then moving on to set an ambush on the Via Litoranea Libica. The Siege of Giarabub (now Jaghbub) in Libya, took place between the WDF and Italian forces. 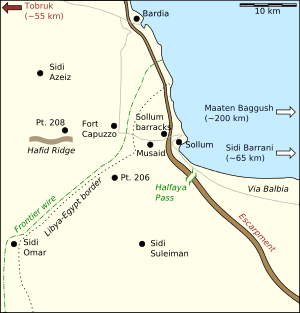 In the aftermath of Operazione E, the invasion of Libya by the Italian 10th Army (9–16 September 1940), Operation Compass (9–16 December) by the WDF, the Battle of Sidi Barrani and the pursuit of the 10th Army into Cyrenaica (16 December 1940 – 9 February 1941), the fortified Italian position at the Al Jaghbub Oasis was besieged by parts of the 6th Australian Division from December 1940 to 21 March 1941. The 6th Australian Divisional Cavalry Regiment (6th ADCR) began the siege in December 1940 and isolated the oasis, leaving the garrison dependent on the Regia Aeronautica for supplies. Air transport proved insufficient and hunger prompted many of the locally recruited troops to desert. After being reinforced by the 2/9th Australian Battalion and a battery of the 4th RHA, the Australians attacked and captured Giarabub from 17–21 March 1941. The Australians left behind a salvage party and withdrew from the oasis the next day, just before Operation Sonnenblume (24 March – 9 April), an Italo-German counter-offensive which recaptured Cyrenaica. After the Allied conquest in 1943, Tripolitania and Cyrenaica were ruled under the British Military Administration of Libya until independence in 1951, as a kingdom under Muhammad Idris bin Muhammad al-Mahdi as-Senussi (King Idris of Libya) and the frontier wire disappeared into obscurity. Lion of the Desert (film). ↑ Soon after the frontier wire system was built, the colonial administration deported the people of the Jebel Akhdar to deny the rebels local support. More than 100,000 people were imprisoned in concentration camps at Suluq and El Agheila, where up to one third of the Cyrenaican population died in squalor. Omar Mukhtar was captured and killed in 1931, after which the resistance petered out, apart from the followers of Sheik Idris, Emir of Cyrenaica, who went into exile in Egypt. ↑ Details taken from Christie (1999) unless specified. ↑ Wright 1982, p. 42. 1 2 3 Metz 1989. 1 2 Christie 1999, p. 14. ↑ Cody 1956, p. 142. ↑ Wright 1982, p. 35. ↑ Pitt 1980, p. 32. ↑ Playfair et al. 2004a, pp. 119, 205. ↑ Playfair et al. 2004a, pp. 113, 118. ↑ Moorehead 1944, p. 13. ↑ Christie 1999, p. 49. ↑ Moorehead 1944, pp. 15–16. ↑ Playfair et al. 2004a, pp. 119, 187, 206. ↑ Playfair et al. 2004a, p. 278. ↑ Pitt 1980, pp. 126, 32. ↑ Neillands 2004, p. 34. ↑ Pitt 1980, p. 127. ↑ Christie 1999, pp. 41–42. ↑ Christie 1999, pp. 87. ↑ Playfair et al. 2004a, pp. 118–119. ↑ Christie 1999, pp. 42–43. ↑ Playfair et al. 2004a, p. 119. ↑ Pitt 1980, p. 33. 1 2 Richardson 2010, pp. 1–30. ↑ B61 1966, p. 3. ↑ Christie 1999, pp. 82, 104. Cody, J. F. (1956). "6 Sollum and Gazala". 28 Maori Battalion. The Official History of New Zealand in the Second World War 1939–1945. Wellington, NZ: War History Branch, Dept. of Internal Affairs. pp. 133–178. OCLC 4392594. Retrieved 8 March 2015. Libya–Egypt (United Arab Republic) Boundary (PDF). International Boundary Study. Washington, DC: United States Department of State Office of the Geographer. 15 January 1966. OCLC 42941644. Retrieved 14 March 2015. Metz, H. C. (1989). Libya: A Country Study. Area Handbook Series (4th ed.). Washington, DC: Library of Congress. Federal Research Division. OCLC 473404917. Moorehead, A (2009) . The Desert War: The Classic Trilogy on the North African Campaign 1940–43 (Aurum Press ed.). London: Hamish Hamilton. ISBN 978-1-84513-391-7. Pitt, B. (2001) . The Crucible of War: Wavell's Command. I. London: Cassell. ISBN 0-304-35950-5. Playfair, Major-General I. S. O.; with Stitt R.N., Commander G. M. S.; Molony, Brigadier C. J. C. & Toomer, Air Vice-Marshal S. E. (2004) [1st. pub. HMSO 1954]. Butler, J. R. M., ed. The Mediterranean and Middle East: The Early Successes Against Italy (to May 1941). History of the Second World War, United Kingdom Military Series. I. Naval & Military Press. ISBN 1-84574-065-3. Wright, J. L. (1982). Libya: A Modern History. Baltimore, MD: Johns Hopkins University Press. ISBN 0-80182-767-1. Christie, Howard R. (1999). Fallen Eagles: The Italian 10th Army in the Opening Campaign in the Western Desert, June 1940 – December 1940 (MA). Fort Leavenworth, KS: U. S. Army Command and General Staff College. OCLC 465212715. A116763. Retrieved 8 March 2015. Richardson, Tom (2010). "The Siege of Giarabub December 1940 – March 1941" (PDF). SVSS Paper. no ISBN. Canberra: Australian War Memorial. Retrieved 23 February 2015. Price, W. (2015). "The 11th Hussars (PAO) The Opening Shots in the Western Desert 1940". The King's Royal Hussars. The King's Royal Hussars Association. Retrieved 9 March 2015. Wikimedia Commons has media related to Frontier Wire (Libya).